In the last issue, the March Class III futures price was set at $13.36/cwt and forecasted to jump to $14.10/cwt in April. The March and April Class III prices actual closed slightly higher at $14.22 and $14.47/cwt. The Class III price future for May is about the same price at $14.44/cwt and is supposed to increase to $15.25/cwt in June. Looking further in advance, the CME Class III futures for summer and fall are currently trading at $16.40 to $16.90/cwt. Overall, milk prices are steadily increasing – this will give producers a little sigh of relief as we wrap up on the 2018 planting season. As in previous issues, these feed ingredients were appraised using the software program SESAME™ developed by Dr. St-Pierre at The Ohio State University to price the important nutrients in dairy rations, to estimate break-even prices of many commodities traded in Ohio, and to identify feedstuffs that currently are underpriced as of May 25, 2018. Price estimates of net energy lactation (NEL, $/Mcal), metabolizable protein (MP, $/lb; MP is the sum of the digestible microbial protein and digestible rumen-undegradable protein of a feed), non-effective NDF (ne-NDF, $/lb), and effective NDF (e-NDF, $/lb) are reported in Table 1. For MP, its current value is 10¢/lb less than March’s issue ($0.50/lb). However, the cost of NEL has gone up 2¢/Mcal since March (7.8¢/Mcal). 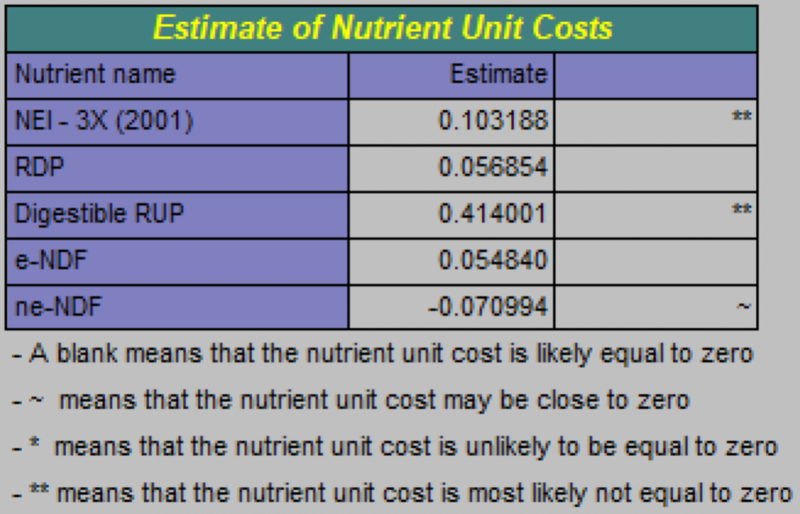 The price of e-NDF is about the same at 5¢/lb, whereas ne-NDF is relatively unchanged from March at -8¢/lb (i.e., feeds with a significant content of non-effective NDF are priced at a discount). 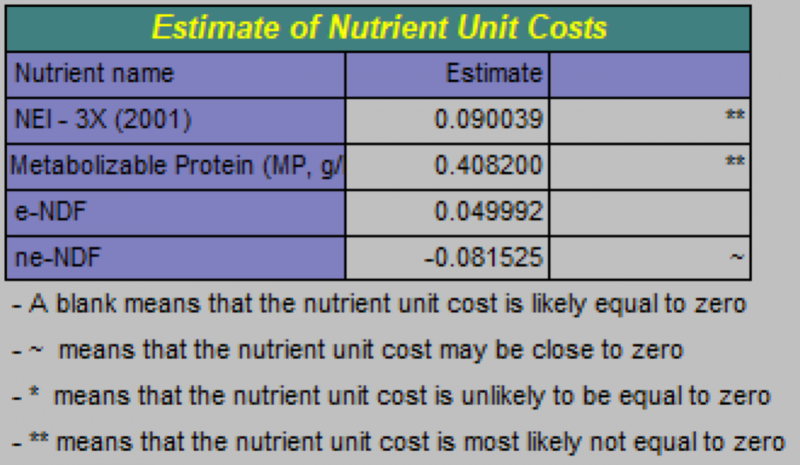 To estimate the cost of production at these nutrient prices, I used the Cow-Jones Index for cows milking 70 lb/day or 85 lb/day at 3.7% fat and 3.1% protein. In the March issue, the average income over nutrient costs (IONC) was estimated to be $7.26/cwt for cows milking 70 lb/day and $7.61/cwt for cows milking 85 lb/day. For May, the IONC for our 70 lb/day and 85 lb/day cows are about $1/cwt higher than March at $8.21 and $8.61/cwt, respectively. These IONC may be overestimated because they do not account for the cost of replacements or dry cows. In summary, these IONC prices are better than March but are still not great. Table 1. Prices of dairy nutrients for Ohio dairy farms, May 25, 2018. Results of the Sesame analysis for central Ohio on May 25, 2018 are presented in Table 2. 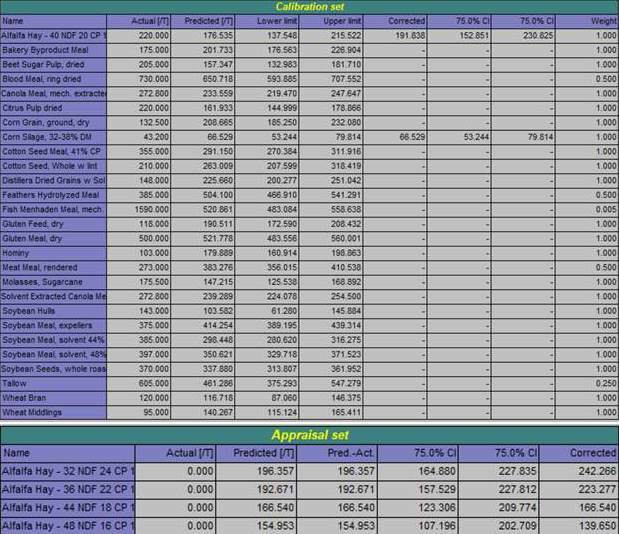 Detailed results for all 27 feed commodities are reported. The lower and upper limits mark the 75% confidence range for the predicted (break-even) prices. Feeds in the “Appraisal Set” were those for which we didn’t have a price or were adjusted to reflect their true (“Corrected”) value in a lactating diet. One must remember that SESAME™ compares all commodities at one specific point in time. Thus, the results do not imply that the bargain feeds are cheap on a historical basis. Table 2. Actual, breakeven (predicted) and 75% confidence limits of 27 feed commodities used on Ohio dairy farms, May 25, 2018. Table 3. Partitioning of feedstuffs, Ohio, May 25, 2018. Table 4. Prices of dairy nutrients using the 5-nutrient solution for Ohio dairy farms, May 25, 2018.